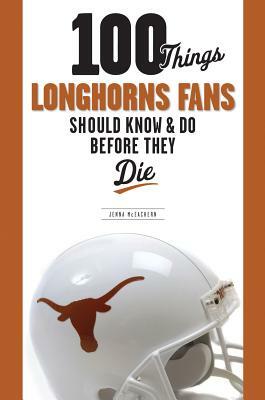 With trivia boxes, pep talks, records, and Longhorn lore, this lively, detailed book explores the personalities, events, and facts every Texas fan should know. It contains crucial information such as important dates, player nicknames, memorable moments, and outstanding achievements by singular players. This guide to all things Longhorns covers the team's first live mascot, the season they broke the NCAA record for points scored, and the player that caught every single touchdown pass thrown in the 1972 season. Jenna McEachern has been a freelance writer and editor for 30 years. She formerly worked for the University of Texas Sports Information Department, served as an editor in the Oral History Department of the LBJ Library, and was a senior editor for the Presidential Election Study Series "Snapshots of the 1988 Presidential Campaign." She is the editor of "One Heartbeat: A Philosophy of Teamwork, Life, and Leadership" and "One Heartbeat II: The Road to the National Championship." She lives in Austin, Texas.